Peter Frase argues that increasing automation and a growing scarcity of resources, thanks to climate change, will bring it all tumbling down. In Four Futures, Frase imagines how this post-capitalist world might look, deploying the tools of both social science and speculative fiction to explore what communism, rentism, socialism and exterminism might actually entail. Could the current rise of real-life robocops usher in a world that resembles Enderâs Game? And sure, communism will bring an end to material scarcities and inequalities of wealthâbut thereâs no guarantee that social hierarchies, governed by an economy of âlikes,â wouldnât rise to take their place. 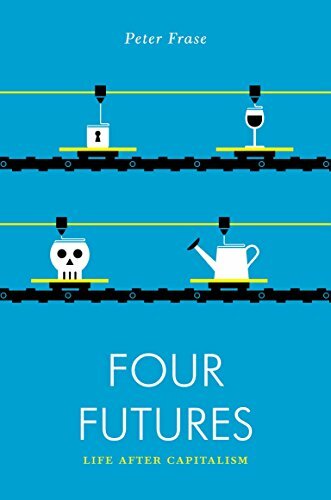 A whirlwind tour through science fiction, social theory and the new technologies already shaping our lives, Four Futures is a balance sheet of the socialisms we may reach if a resurgent Left is successful, and the barbarisms we may be consigned to if those movements fail. About: Capitalism is going to endPeter Frase argues that increasing automation and a growing scarcity of resources, thanks to climate change, will bring it all tumbling down.